Admission is free. Reservations required. RSVP beginning Tuesday, February 26, at 9 a.m. Witness and experience music-driven mindfulness in a concert of meditative music performed by the USC Thornton Percussion Group. The concert will open with a group meditation led by Mark Miller of Mindful USC. This transcendent event will encourage mindful listening and living, and will be followed by a discussion and Q&A on meditation, music, sound, and being present to the world around us. In the week leading up to the concert, a series of pop-up performances around campus will feature Thornton musicians performing a musical walking meditation by USC composer Veronika Krausas. The musicians will play and move within individual pods, like floating sculptural sound objects. Short mindful statements written by Molly Bendall’s poetry writing class will be offered to the public as the musicians pass by. The pods originally conceived and designed by Florian Idenburg of SO-IL architects and artist Ana Prvački for the 2017 Chicago Architecture Biennial will be refabricated by Matthew Gilpin and students Peter Eusebio, Chentao Yu, and Alexander Candelaria-Fouse from the USC Viterbi School of Engineering. Composer Veronika Krausas is a professor in the USC Thornton School of Music. The Globe and Mail writes, “her works, whose organic, lyrical sense of storytelling are supported by a rigid formal elegance, give her audiences a sense that nature’s frozen objects are springing to life." Commissions and performances include The Los Angeles Philharmonic, The Industry, New York City Opera, and many others. The USC Thornton Percussion Group, directed by Joseph Pereira, focuses on music of our time and music by early percussion pioneers John Cage and Lou Harrison. The ensemble consists of USC percussion majors, but has always modeled itself after a professional new music group. The ensemble has premiered many new works and has worked with composers and performers from the local new-music scene, including appearing in the LA Philharmonic’s Green Umbrella series. Molly Bendall is the author of five collections of poetry, most recently Watchful from Omnidawn Press. She has won the Eunice Tietjens Prize from Poetry magazine, the Lynda Hull Award from Denver Quarterly, and two Pushcart Prizes. Her poems and reviews have appeared in many literary journals. Currently she teaches creative writing and literature at the University of Southern California. Matthew Gilpin is a full-time lecturer in Aerospace & Mechanical Engingeering at USC. He is in his third year of teaching “Senior Projects” (AME 441), which facilitates independent student projects of their own design. Projects run from conception to completion during a 15-week semester and have covered topics including optimizing solid rocket ignition, designing airfoils for Mars UAVs, and a kinetic energy recovery system for a recumbent bicycle. 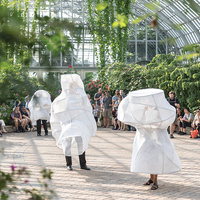 Photo by Iwan Baan of original pods and performance conceived and designed by Florian Idenburg of SO-IL architects and artist Ana Prvački for the 2017 Chicago Architecture Biennial at Garvey Conservatory. Presented by USC Visions and Voices: The Arts and Humanities Initiative. Organized by Kristy Morrell and Veronika Krausas (Music). Co-sponsored by the USC Thornton School of Music, Mindful USC, the USC Dornsife College of Letters, Arts, and Sciences, and the USC Viterbi School of Engineering.